Hello everyone. 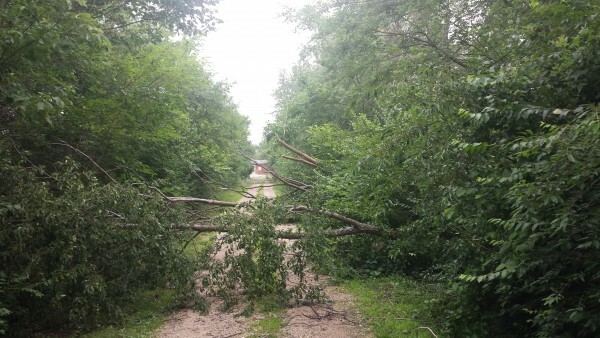 The APRHF president wanted to update you on the condition of the lookout road in LaPlata, MO. We know quite a few folks like to come and watch trains from this area. We are working as fast as we can on getting the road cleaned up but right now we are at the mercy of the insurance company adjustor getting here. There has been many homes and buildings damaged so the adjustors are working overtime. I took a walk with a contractor yesterday and found,other than trees across the road, there are many broken and leaning ready to fall from the sides. This has created a potentially dangerous situation. So this area will remain closed until the proper cleanup can be acheived. We are sorry for the inconvenience it may cause but also can’t stop mother nature. Feel free to come down to the Amtrak station or venture out to otehr safe areas to watch trains. Thank You for your understanding. Many big trees down on the road. Now I want to take this time to talk about other tree removal that needs to happen so the railscams are fun again. The same contractor and I looked at what needed to be cut back. There is a lot of work to be done. They estimated about $6000.00 to properly clean the hillsides for many more years of train watching via railcam. That is something we cannot claim on insurance. So that will have to be a fundraiser. Please help us help you. We will get it cleared ASAP as soon as the funds are available. Please donate here. We thank you in advance for your support of this project.